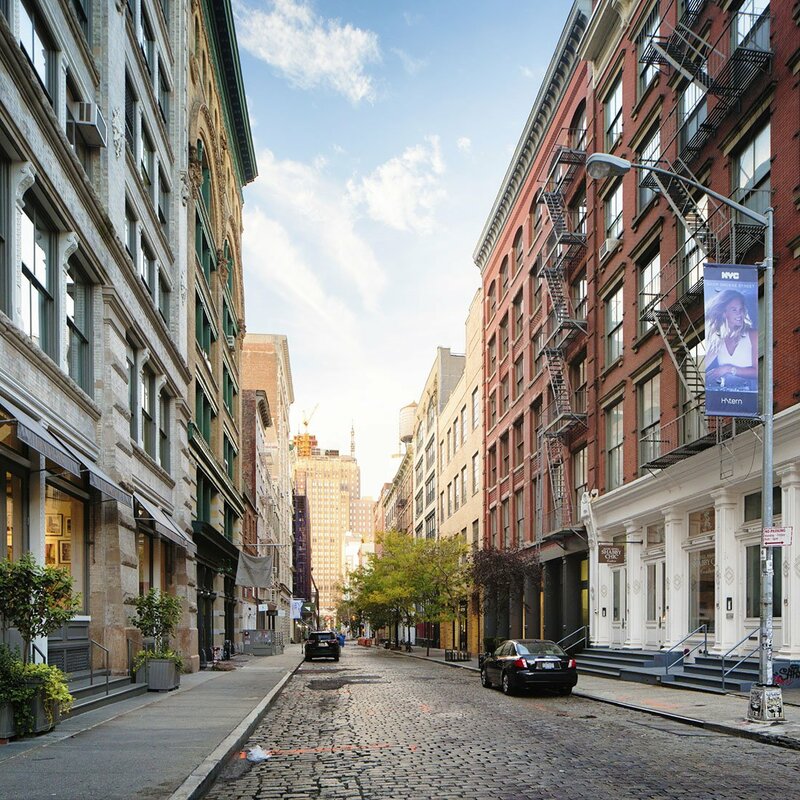 Whether you’re an excited tourist just arriving in New York City or a local in search of some awesome places to make you fall in love with the city all over again, we’re here to help. We have curated a truly fantastic list (if we do say so ourselves) to give you a Gessato NYC experience. Delicious food and coffee? Check! Modern art, entertainment and design? Yep! Shopping or outdoor spaces? Of course! So put on your most comfortable shoes and start exploring the city with our guide. Nestled in Manhattan’s Lower East Side, Aeon Bookstore is a new shop that welcomes book lovers in a friendly, relaxed space. The store specializes in the underground facets of culture, offering access to an expertly curated yet still inclusive selection of books, records, and tapes. Here you can find used and new tomes in genres that range from art and philosophy to the occult, visual arts, and social sciences – to name a few. Located right under the Manhattan Bridge, on the second floor of the East Broadway Mall, 2 Bridges Music Arts is more than just a ‘hidden gem’ bookstore. Apart from new and used books in an array of genres, here you can also find an incredible selection of specialized records and tapes that range from experimental music to rare anthropological recordings and ritual music from far away lands. Plus, the shop also hosts art exhibitions and cultural events, making it a must-visit place for book, music, and art lovers alike. A treat for Thai food lovers and foodies in general, Pinto serves a modern menu that complements authentic Thai staples with creative twists. The dishes burst with flavor, whether you want to go for a classic green curry or a salmon with a sweet and sour sauce. Vegetarian and vegan options are also available, along with a good selection of Thai wine and beer. Cozy and elegant, Pinto is ideal for lunch with friends or date nights. A quintessential NYC cafe, Little Canal is small but cozy and welcoming. White brick walls, vintage furniture, and music coming from a record player give this place a cool, laid-back vibe. Take a seat in front of the large window overlooking the street to watch the world go by while sipping a cup of good coffee. The menu includes everything from espresso and other coffee drinks to pastries, sandwiches, and salads. And unlike most cafes, Little Canal remains open in the evening, when you can order wine, beer, and a bite to eat from the dinner menu. Stylish and creative, The Hidden Pearl manages to bring something fresh to New York City’s kaleidoscopic bar scene. And you only have to walk in to see why. The chic decor features shades of blue, brass accents, and leather and bronze seating – all flooded in natural light. The menu takes customers on a flavorful trip to tropical Japan, whether it’s through bourbon infused with miso and sake cocktails to small bites that offer modern twists on traditional Japanese food. A hidden gem, indeed. Specialty food shop. Coffee shop. Bakery. Sandwich heaven. Charcuterie and artisanal cheese nirvana. Craft beer destination. Neighborhood hub Peck’s Food defies the one label classification and embraces them all. Which means that everyone will find something good here to chow down and guzzle. Or simply enjoy slowly, if that’s more of your thing. The first Bookmarc store opened in 2010 in New York, before the concept spread to London, Tokyo and Paris. As you’d expect from the renowned Marc Jacobs brand, in this elegant bookstore you’ll enter a world of refined style and culture as you browse through fine art, photography, fiction, music, and pop culture titles, as well as a range of rare books. This independent bookshop offers an array of books organized in distinct ways (fiction in country categories, for example), specialty magazines, quirky greeting cards, good coffee, and an intimate ambience all in one. The décor is also creative and has whimsy accents, with books hanging from the ceiling. There’s plenty of fish in the sea, but the freshest can be found at Citarella. That’s because the company has eliminated the middle man over 30 years ago and works directly with fishermen to bring only the best fish and seafood to the Citarella shop. But even if you’re not a big fan of fish, you can drop in for the great selection of gourmet food. Blue Apron Foods is a gourmet food shop that features locally sourced products but also a carefully selected range of specialty products from all around the world. Treat yourself to breads and cupcakes from local bakeries, high-end charcuterie, artisanal cheese, delicious sweets, and locally roasted coffee. At Di Palo’s you’ll discover the authentic flavors of Italy. Cheese, cured meat, sauces, pasta, and olive oil – they are all handcrafted in various regions in Italy and selected during frequent trips to the country. 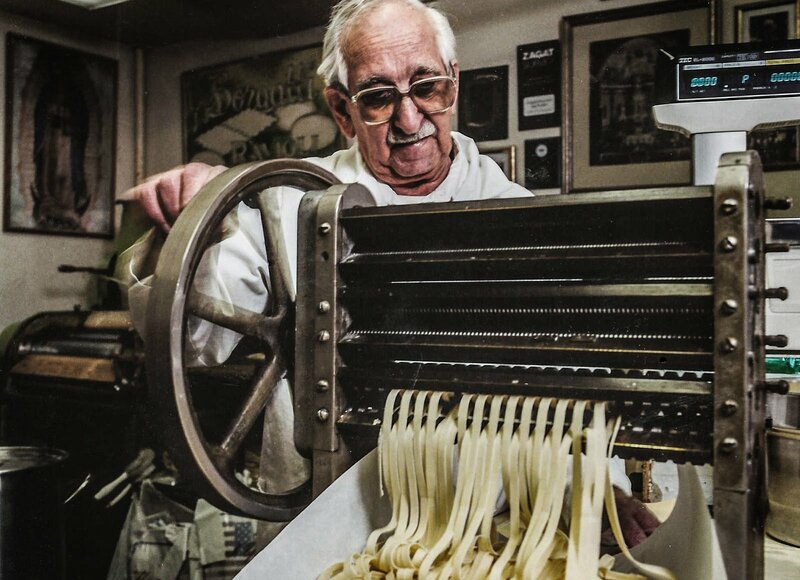 Opened since 1924, Di Palo’s is now run by the fourth and soon the fifth generation, but has always maintained its original mission, of bringing a slice of Italy to the heart of New York. If you love chocolate, definitely visit Cacao Prieto. It’s a chocolate heaven filled with 100% organic, in-house handmade chocolate and cocoa-based liquors and rums. The family-owned business is one of the few chocolate companies in the world directly involved in every step of the manufacturing process, as the Prieto family has farmed organic cocoa in Dominican Republic for more than 100 years. A must-visit place for all book lovers, the Strand is a legendary bookstore opened in 1927 and run now by the second and third generation of the family. 2.5 millions of books await behind the doors of the bookstore, and they range from new items to vintage treasures and much loved used books. 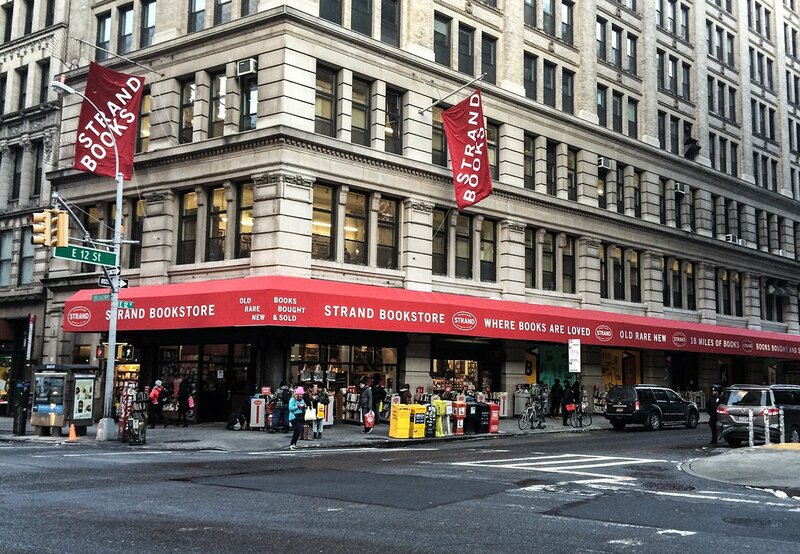 The Strand declares that all book lovers are welcome. We’d say that even if you’re an e-book fan, you should drop in. Who knows, you may find a hidden gem or even fall in love with books all over again. The Steven Alan brand is timeless and understated, providing expertly tailored clothing made from high quality materials and a wide range of accessories. Apart from the Steven Alan collection, you can also find products created by renowned brands and designers, like Acne Studio, Shinola, Comme des Garçons, or Vault by Vans. This is the largest Muji store in the US, and it lives up to that label. Stepping inside, you’ll be swept into a Muji wonderland. Here is where you can create your own diffuser or perfume by using 48 different scented oils, embroider your new products at the embroidery station, or customize your purchase with stamps. At the store you’ll also discover the largest section of Found Muji products in the US, which showcases traditional items from various places all around the world. Mykita has stores in numerous cities, from New York and Paris to Tokyo and Berlin, where customers can discover a vast range of premium glasses with minimalist frames and German lenses. The NYC flagship store has a striking and bright contemporary décor that combines mass-produced objects, displaced from their original context, custom designed furniture, and lighting effects. It’s a beautiful space that looks and feels like a stage or art installation. Opening Ceremony was founded by two friends who left their jobs in corporate fashion to open a place where they could share their love of art, fashion and travel. The name comes from the modern Olympic Games, which also inspired the concept of the brand. While promoting iconic US designers and artists, Opening Ceremony also showcases international designs from a different country each year, bringing an exotic flavor to NYC. The two stores are located next to each other; the more recently opened shop offers stylish menswear created by renowned designers, while the original store features womenswear, a bookshop, and shoe gallery over four levels. Worth and Worth was founded in 1922 and is currently one of just three remaining custom hat makers in the US. Handmade from the finest materials and custom designed, the hats created by the brand make a bold statement and allow the wearer to express his or her personality in a chic way. Here you will find a hat for any occasion and designs seemingly plucked from vintage films or taken straight from the sunny coasts of Italy. We tip our hats to Worth and Worth. If you want to immerse yourself in the surfing lifestyle while strolling through the heart of New York, you have to check out Saturdays Surf NYC. Where else would you find handcrafted surfboards and hand planes alongside books, apparel, art and grooming products? To top it all off, you can also stop for a coffee here, as the baristas are some of the best in the city. Shinola believes that American manufacturing is the way forward to a future where excellence, skill and craftsmanship revive the beauty of industry and bring communities together. And this is not just a ‘feel good’ statement on an About Us page. They put their money where their mouth is. Shinola proudly designs and makes its handcrafted leather goods, watches and bicycles in Detroit. 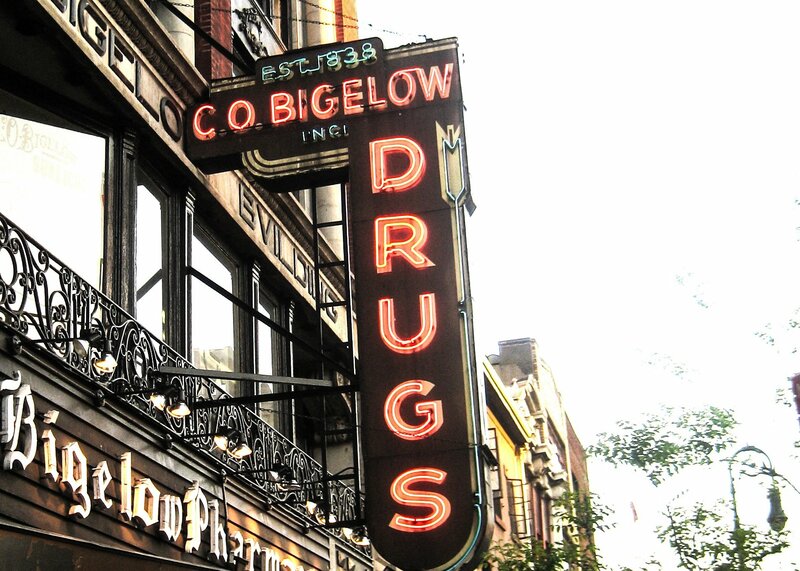 The New York flagship store is located in Tribeca – go there for high quality products with a red, white and blue heart. 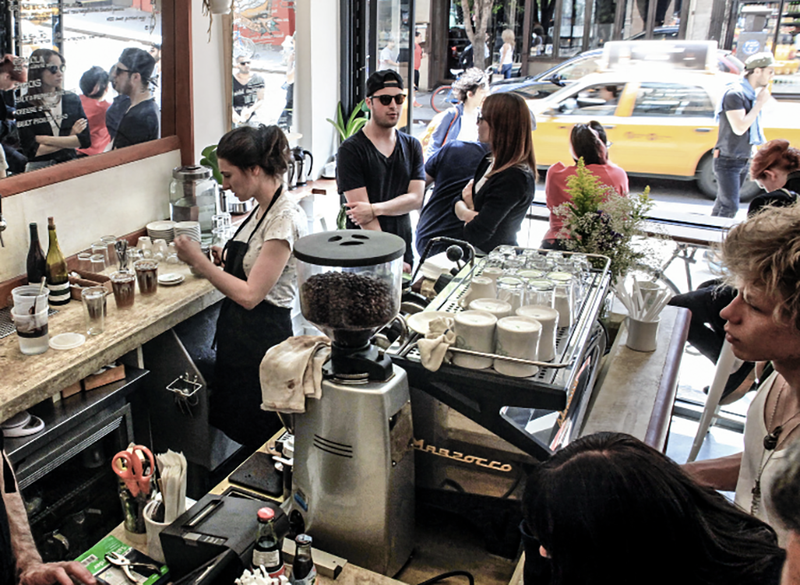 Culture Espresso has been waking up NYC residents with great coffee since 2009. Like all the best coffee places, this one puts value on the quality of the beans, working with one farmer or coffee roaster at a time. Here you can also sink your teeth into some delicious chocolate chip or oatmeal cranberry cookies. Which are baked in house. Do we need to say more? If you love Nordic design just like we do, don’t forget to take a trip to Búðin. This cozy coffee place was opened by three friends that wanted to combine their love of coffee, a passion for the Nordic aesthetic and their Icelandic heritage in a New York City context. Here you’ll find high quality specialty coffee, draft beer, and houseware created by Scandinavian designers. Oh, and Búðin means ‘The Shop’ in Icelandic and it’s pronounced as “Boo-th-in”. When you’re in a need for a coffee fix and you’re also really hungry, you can’t go wrong with El Rey. Here you can order a cup of joe roasted by the coffee artisans at Parlor Coffee and a delicious brunch while enjoying the light, airy ambience of the interior. If you’re planning to go to El Rey this summer, you can also cool down by ordering the Mexican iced mocha which is made with a bit of Aleppo pepper and mint. Located in Chelsea, Joe Pro Shop/HQ is more than just a place where you can order an aromatic cup of joe. 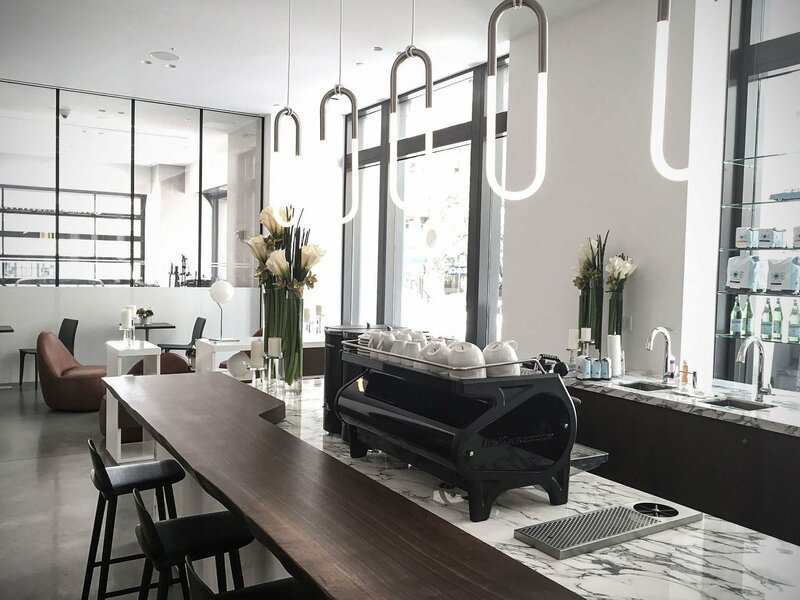 Here you’ll enter a coffee making wonderland where you can buy various types of equipment and also learn how to use your new machine to brew your own cups of good coffee. Plus, there’s also a vast selection of coffees from various North American coffee roasters to choose from. Relaxing and welcoming, Qathra Cafe is a wonderful choice if you’re looking for good coffee and good food with a difference. The owner James works closely with local businesses to provide high quality products to his customers. Most of the food is sourced from farmers’ markets and local bakeries, while the coffee comes from a small business managed by a mother and son who buy the coffee directly from Nicaraguan farmers, roast the beans in Williamsburg, and sell them directly to James. If you’re looking for an authentic Italian cafe experience, put Zibetto Espresso at the top of your list. 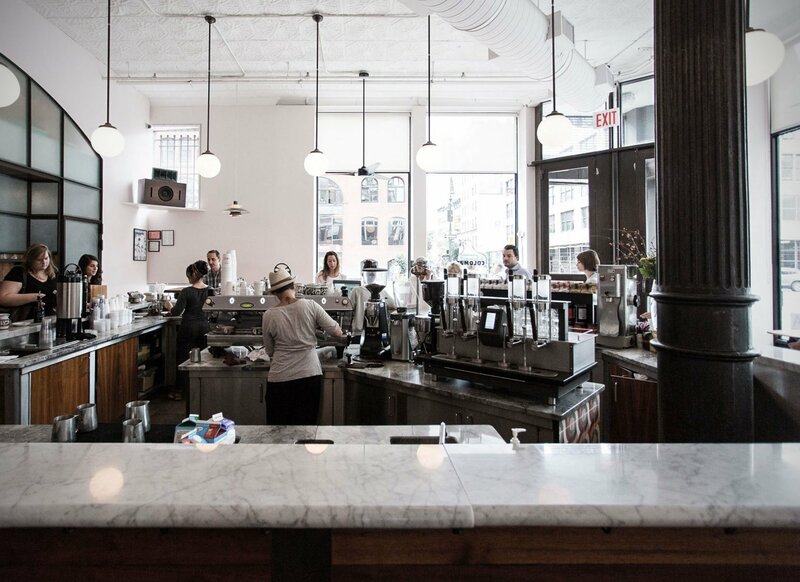 This coffee place opened in 2006 with the goal to bring a piece of Italy to NYC. The coffee beans are roasted and blended in Italy, while the espresso machine is made by La Cimbali, a manufacturer who has been producing state of the art espresso machines for over 100 years. The ambience is spot-on, so make sure you pay a visit while you’re in the neighborhood. And don’t worry, even if this place is packed, there’s always seating available at the counter. The guys behind Brooklyn Roasting Company love coffee. Like, really love coffee. They taste their coffee before they decide to buy it from the local farmers, again before the beans are shipped, and yet again after it’s roasted. That’s dedication (blended with an undeniable love of coffee). The Brooklyn Roasting Company also offers organic, fair trade, and Rainforest Alliance certified coffee and uses refurbished equipment and recycled materials. And it’s in Brooklyn, which we think makes it even better. A restaurant that takes the charm of old-school diners (including the bar stools and counter), and filters it through a cool, Williamsburg lens. Some might say hipster, we prefer to say cool. The menu changes everyday and it’s written by hand by the waiter/waitress on your table. The burger is reportedly one of the best in Brooklyn and you’ll always find it on the menu. Rustic and warm California meets refined and urban New York on the plates at Upland, named after the city in San Bernardino County. Here you’ll find great food with seasonal ingredients and dishes that let veggies take the spotlight. You’ll also get a treat at Upland: the décor features patinated copper, oak, leather, custom-blown glass and is designed by the Roman and Williams studio. You’ll also see murals created by celebrated artist Wayne Pate. Barbuto offers rustic Italian food made with seasonal ingredients. That makes the menu change regularly, so you have the opportunity to taste something different every time you go to this West Village restaurant. The open kitchen and the large windows create an airy, laid-back atmosphere, ideal for meals with friends. Santina is located in a former garage underneath the Highline in the Meatpacking district. If this doesn’t sound too stylish it’s because we didn’t mention the restaurant was designed by renowned Italian architect Renzo Piano. But this is not a pretentious place; it’s a comfortable, feel-good restaurant with food inspired by coastal Italian dishes and the rich heritage of the neighborhood. You can drop in at any time without a reservation, but don’t forget to order one of their cocktails. When it opened in 1994, il Buco was an antique store that offered a rustic “pranzo” experience to its customers. Now it is one of the most poplar restaurants in New York. It has a 200-year old wine cellar housing over 400 wines from artisans, boutique producers and world-renowned wineries, as well as an Italian, Spanish and Mediterranean menu. The décor is romantic with a vintage flavor, making il Buco the place to go to with your significant other. Or first date. Or the friends you love. At the Vinegar Hill House you can devour a rustic pork steak (made in an actual wood-fired oven) followed by a delicious and creative Sunflower Panna Cotta as you enjoy some peace and quiet under a cherry tree. Yes, this cozy restaurant on the Brooklyn waterfront has a fantastic outdoor dining area, so make sure you visit when the weather’s all nice and warm. Come for the fantastic food, stay for the fantastic food plus the friendly atmosphere. At Babbo, the famous Italian hospitality combines with the mouthwatering traditional cuisine and modern twists on beloved dishes. Their impressive wine list is what dreams are made of. Oh, did we mention there’s a pasta tasting menu? You’re welcome. Since it’s named after Frederick Law Olmsted, the renowned landscape architect who co-designed Brooklyn’s Prospect Park and Central Park, you can expect to find a lush green paradise at Olmsted, both outdoors and on your plate. Seasonal, fresh, and green are some of the keywords to describe this neighborhood restaurant located in Prospect Heights, Brooklyn. There’s a living wall AND a back garden; in the latter you can see the veggies that will be prepared into savory dishes.